Located in Alameda, 45 minutes from Malaga and one hour from Cordoba, the country house is set in a quiet atmosphere surrounded by nature. 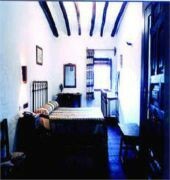 The rooms are predominantly decorated with wood and are luminous and quiet. Facilities include an outdoor swimming pool, as well as table tennis and pool/snooker. There are a total of 21 rooms. Also avaliable is a wedding halls, a restaurant and Internet access.